Once the Ice Age glaciers retreated, humans moved into northern Britain and the nearby islands. The Neolithic (late Stone Age) culture quickly advanced up the islands of the west coast of the Scottish Highlands. The Megalithic culture came with it. Some of these late Stone Age inhabitants built subterranean dwellings now known as sousterrains. 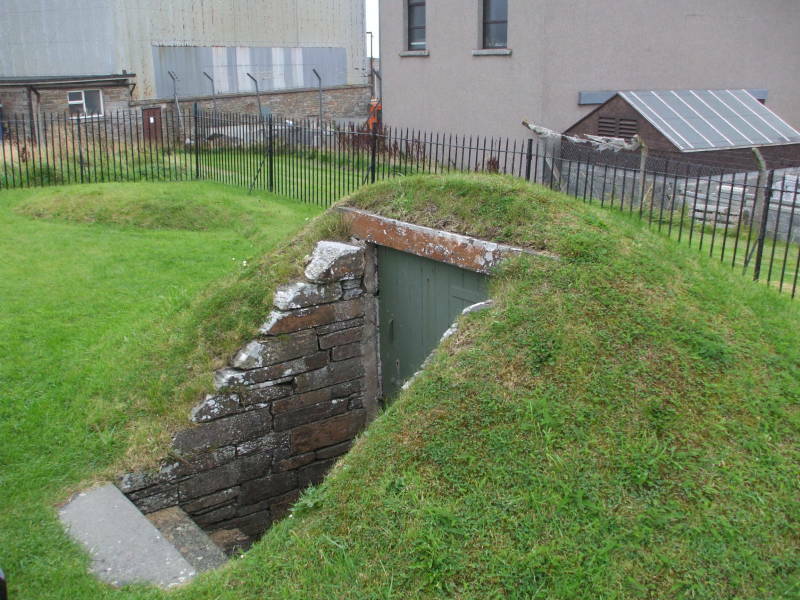 Let's explore a sousterrain near Kirkwall, the largest town in the Orkney Islands. 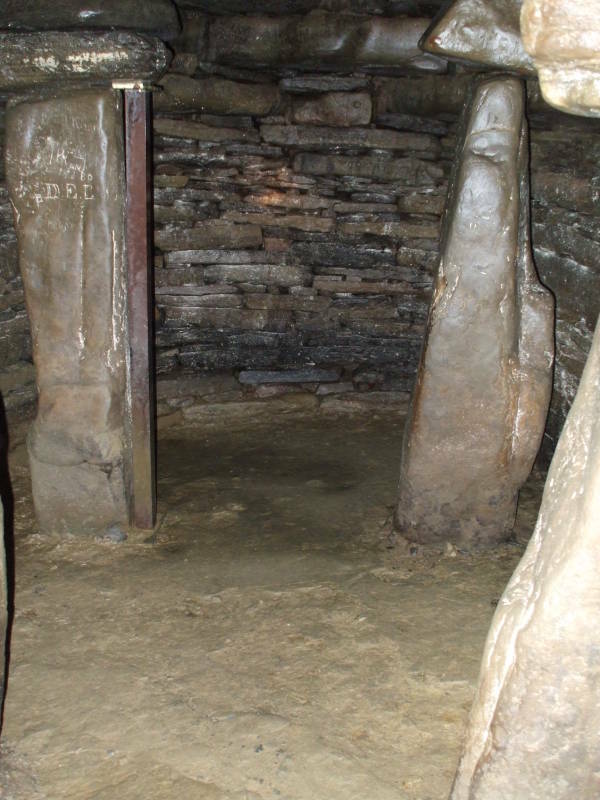 Skara Brae on the largest island in Orkney was occupied roughly 3100-2500 BC. The Orkney Islands have a lot of sandstone that easily splits into useful thin slabs. 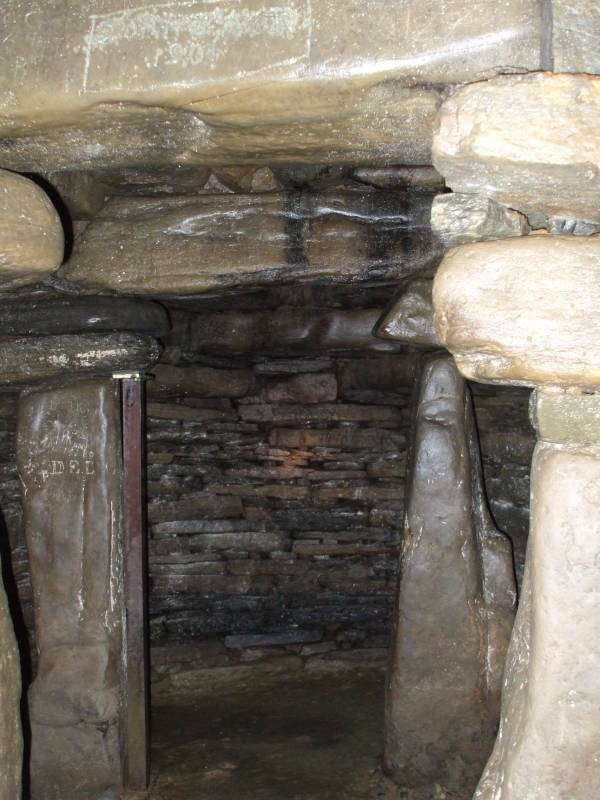 These were used to build dwellings, many of them underground or at least partially so. 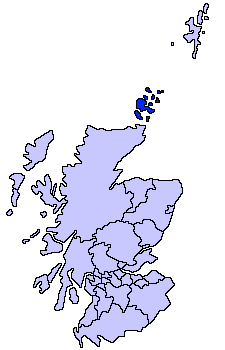 Map of Scotland, Orkney (highlighted), and Shetland. The Pictish people lived in eastern and northern Scotland from times before history until the 900s AD. They're fairly mysterious, little known as they left little language beyond some place names and next to no written records. Their language is generally thought to have been related to Common Brittonic, the ancient Celtic language spoken in Britain before the Anglo-Saxon settlement of the early 5th century AD. The Pictish language had gone extinct by 900 AD, by which time it seems to have effected the syntax of Scottish Gaelic. Kirkwall is the capital of the Orkney Islands and its largest town. The size is a relative thing, this being Orkney. The population of Kirkwall is about 8,500. Its name comes from the Norse, as do so many names in Orkney, from Kirkjuvgr meaning Church Bay. Kirkjuvgr was corrupted to Kirkvoe, then Kirkwaa. English cartographers mistook the corrupted Norse waa for the Scots wa, meaning wall, hence the current name. 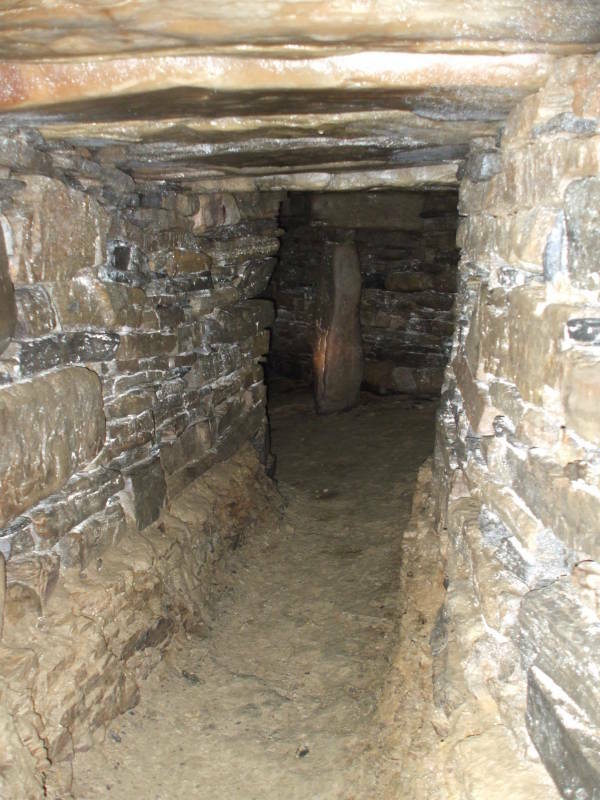 The town was mentioned in the Orkneyinga Saga in 1046, when it was recorded as the home of Rögnvald Brusason, the Earl of Orkney, who was killed by his uncle Óorfinnr inn Riki or Thorfinn the Mighty. Thorfinn was the most powerful of all the Earls of Orkney, with influence beyond the Northern Isles. He may have been a cousin or even a half-brother to Mac Bethad mac Findlaích, commonly known today as Macbeth. He visited the royal court in Norway in 1020, and later he made a pilgimage to Rome and brought Orkney and Shetland into mainstream Christendom. 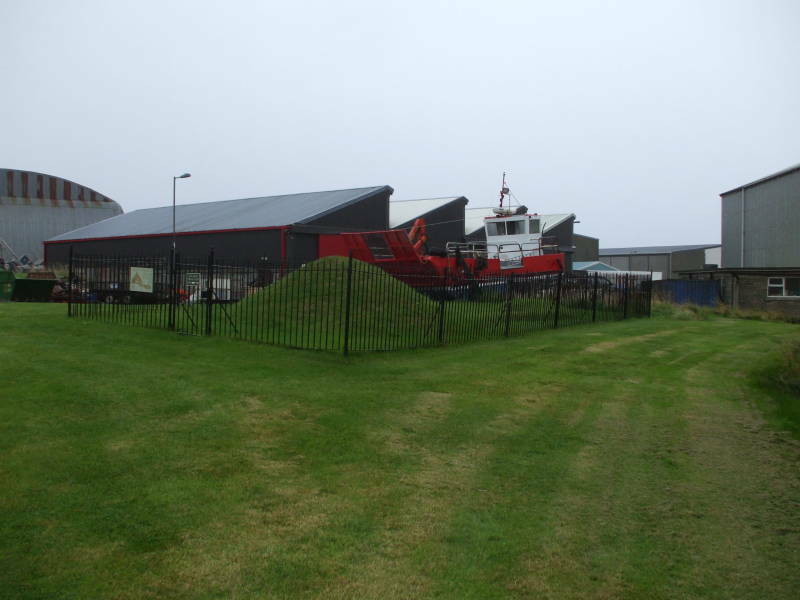 Now Kirkwall is the administrative capital of Orkney, with ferry connections to Aberdeen and Lerwick on the Scottish mainland, and north to other islands. 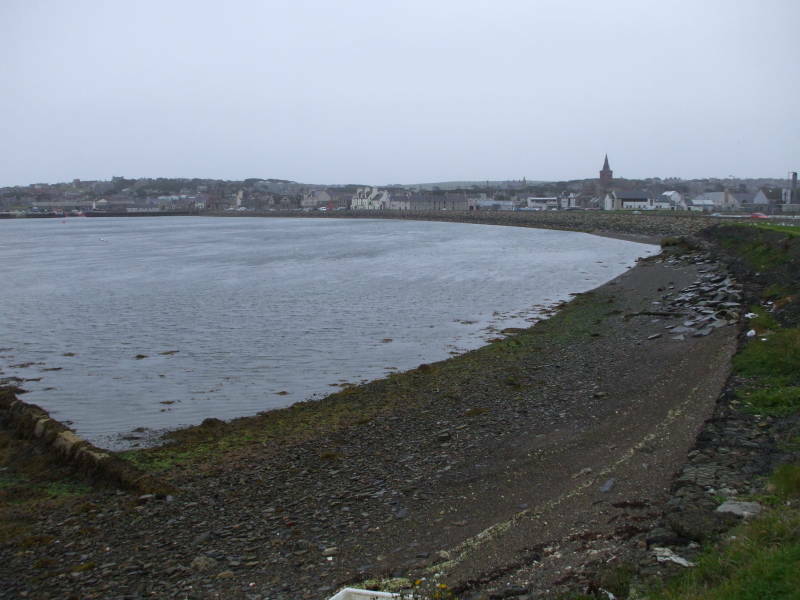 Kirkwall as seen from the west side of its harbor. The Ordnance Survey maps, at least the highly detailed 1:25,000 one, show some ancient structural remains labled sousterrain. Sometimes discussion of Neolithic and Iron Age cultures spells it souterrain, but I'm going with the Ordnance Survey map and the original French spelling. That's French for "under the ground". 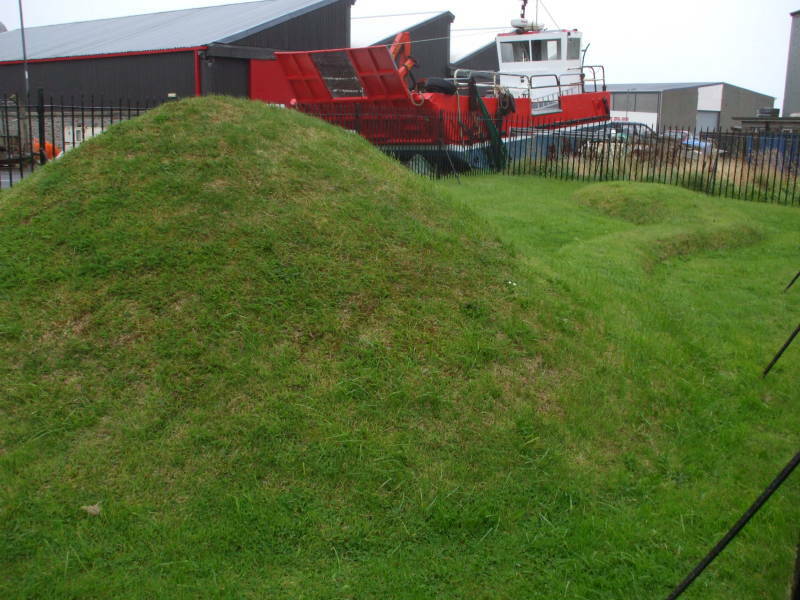 What's a French-named "underground" ruin doing on islands off the north coast of Scotland? Remember the Pink Floyd song, "Several Species of Small Furry Animals Gathered Together in a Cave and Grooving with a Pict", from the 1969 Ummagumma album. A little investigation discovers that the sousterrain is mentioned, at least slightly, in the local tourism information. There, they call it the Grain Earth House. You can find it on the 1:25,000 Explorer map #461, Orkney — East Mainland or the 1:50,000 Landranger map #6, Orkney (Mainland). First, get to Kirkwall. 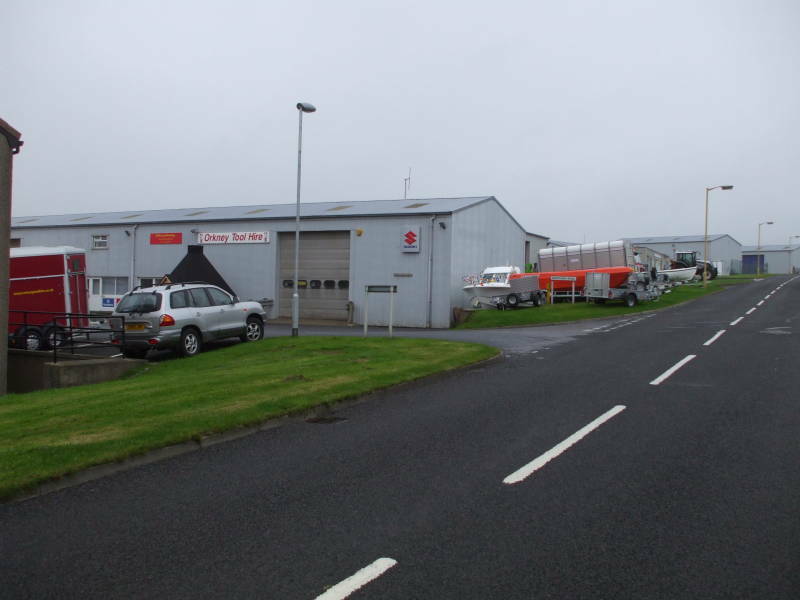 It's the transport hub of Orkney. So, as Orcadian transport goes, this is relatively easy. Then walk toward the northwest edge of town, in the direction of Stromness. You're looking for the Ortak Visitor Centre and Factory, which is really just a large jewelery showroom. Go in there and ask for the keys and lantern for the sousterrain. I know this sounds like an awfully strange protocol for underground exploration, but that's really what you do. The lantern is a fairly big thing, with a large 6-volt battery block. The keys are attached to a key fob that takes the bulky form of a one-kilogram block of brass. Yes, that makes it very difficult to forget that you have the keys in your pocket and forget to return them. They will give you directions when you pick up the keys and lantern, but it's a simple route. 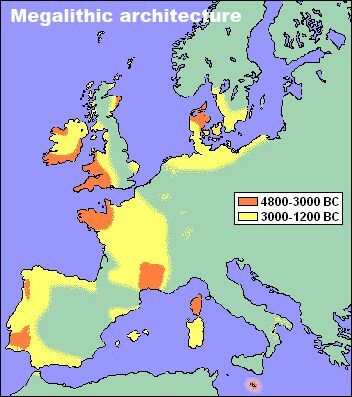 Map of the development of megalithic architecture in Stone Age Europe. Continue down the waterfront road, then take the first road inland to your left. This road goes up a slight incline through a light industrial area called the Hatston Industrial Estate. There's a veterinary clinic, a place renting tools and trailers, various vehicle parts supply and repair places, and at least one place doing boat repair. You find the sousterrain right in front of a boat repair place. The road through the industrial estate. The exterior of the sousterrain. There it is, enclosed in a black iron fence. Right in front of a small ferry that's been hauled up here for repair. The sousterrain structure as visible above ground. You can see the sousterrain's shape before you open the outer gate. A large hump is obvious from a distance. Look closer. You can see a much lower sinuous ridge ending in a small round hump. First, open the outer gate and go inside the fence. You will see that there's a modern locked wooden door installed in the large entrance hump. Unlock and open that door, and realize why you have the big lantern. Descending the sousterrain entrance stairs. The sousterrain goes deeper than you may have thought after seeing its appearance above ground. 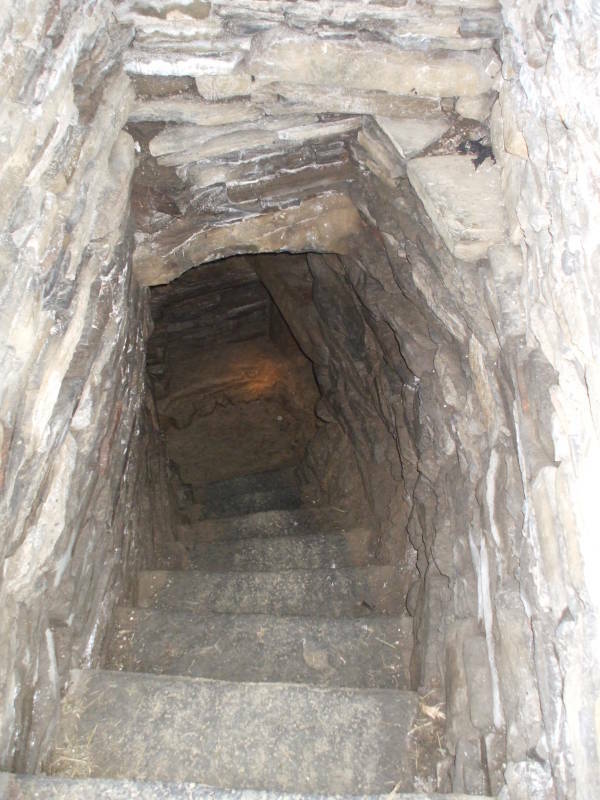 A square tunnel leads off to the left from the bottom of the entrance stairs. 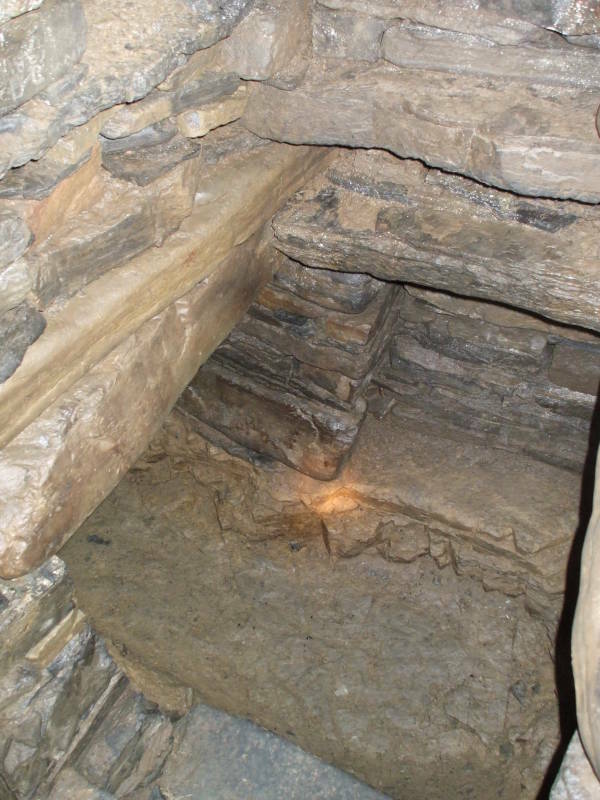 It seems that sousterrain construction started by the excavation of a trench and pit, what would become a tunnel and dwelling or storage chamber, respectively. The side walls were constructed from local stone, cut in this case into rectangular blocks. A ceiling was built from large slabs. The slabs can span the narrow tunnel on their own. For wider spans, as in the main chamber, support columns would have been constructed first. The resulting structure is then buried. 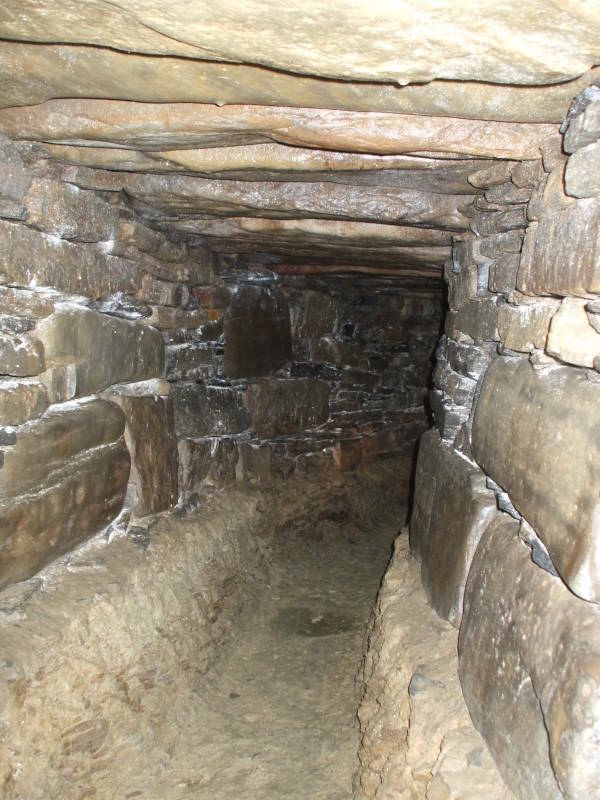 The tunnel and main chamber may be visible as mounds above grade level, but you can see from this picture that the sousterrain itself is a buried stone structure. It's not simply a tunnel dug through the ground. The tunnel at the base of the entrance. 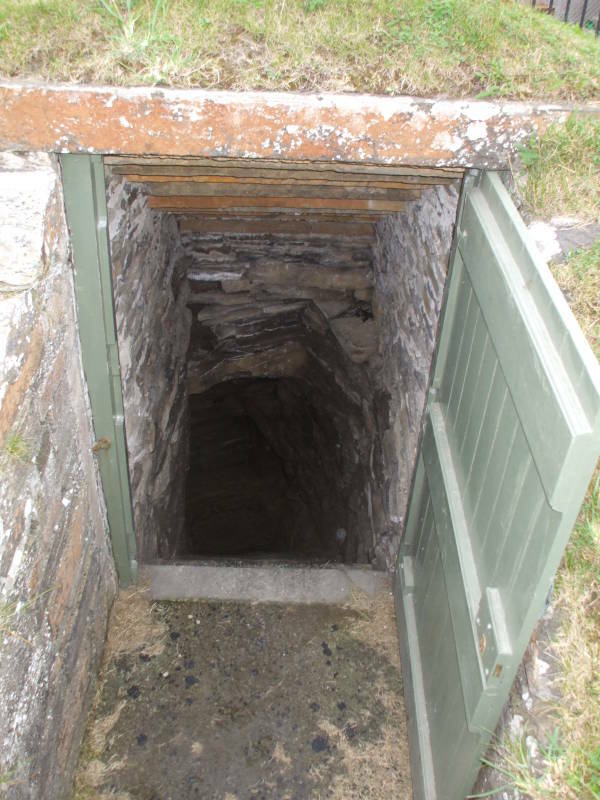 As you go round the last bend you can see the opening into the main chamber. Turn to your left and get ready to crawl. This tunnel is about 1.5 meters tall by 1 meter wide. It curves along its length of approximately 10 meters. You can see how it curves slightly to the right, and you can see the block walls and rock slab roof. The sousterrain tunnel opens into the main chamber. 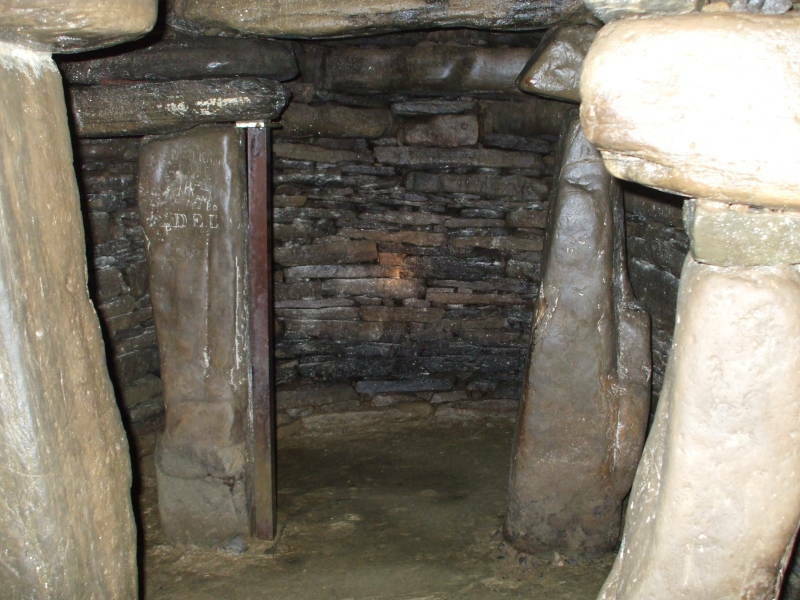 The main chamber of the sousterrain is oval, about two meters wide and four meters long. The ceiling is just over 1.5 meters high, just slightly higher than the tunnel. It's enough to make you gather together several species of small furry animals and groove here within the main chamber of the sousterrain!